Gwynne, Thanks for sharing the ongoing efforts of the Smithsonian. 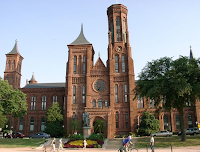 The Smithsonian does a great job with rich media on their musuem web sites. The discovery journey could be enhanced if the existing content was availabile in sharable content objects. This would empower people to easily share their passions about art and history the same way we share Google YouTube videos. Can you imagine if we had a Smithsonian Application Programming Interface (API) like the Twitter API? This would empower people to create mashups, apps, mobile apps, and mini sites. I would also like to access an area where I can download podcasts/mp3s of the audio tour to my iPhone/iPod/mp3 player to use during my visit. They already have the content, why not make it available? Wow, what great ideas. I really like your youtube analogy--the Hirshorn online? Others know much better than me, but museums have unique issues with "new" media and how it affects the sharing of their collections. I was at a show at the Pottrait Gallery in the winter, and people were able to load the audio to their ipods. Easy, yet very impressive.